For lovers of the magnificent flourish and the grand gesture we present our Florentine Cascade journals. Sumptuousness is the name of the game for these stunning Spanish designs taken from a plate in a book containing over a hundred decorations adorning everything from murals to wallpaper to tapestries. Neither shy nor retiring, the Florentine style was exuberant in every respect. Bask in the golden eye of the Tuscan Sun cover or gaze into the shimmering depths of the blue Delphine design and rediscover your commitment to extravagance. 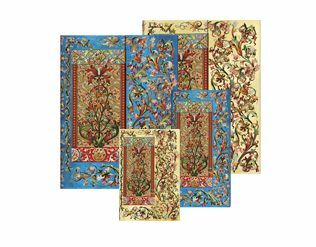 These colourful journals celebrate the art of ornament, flights of filigree and the fullest expression of the decorative arts in pattern on paper. These journals are the next best thing to actually lounging about in a Tuscan garden. The original book of designs was published in the 1890s by Ginés Codina y Sert, and the sense of visual abundance and splendour is as welcome today as it was then.